Is Charity Finance Failing to Keep Up? Are you tired of seeing investment across the business that can’t integrate with your finance infrastructure? A finance application that can’t simply, and easily, integrate with your fundraising or contact management systems cost time, outdated finance and accounting technologies pose risk, and on-premise “traditional” accounting technologies can’t offer SaaS pricing options and require regular “upgrades” which cost money. LEAP Confronting Conflict is a perfect example of a charitable organisation that is reaping the rewards of a cloud-based finance solution. Paypal donations made via their website are uploaded to fundraising software whilst cash matching and PayPal reconciliation is completed in one simple step within Aqilla. 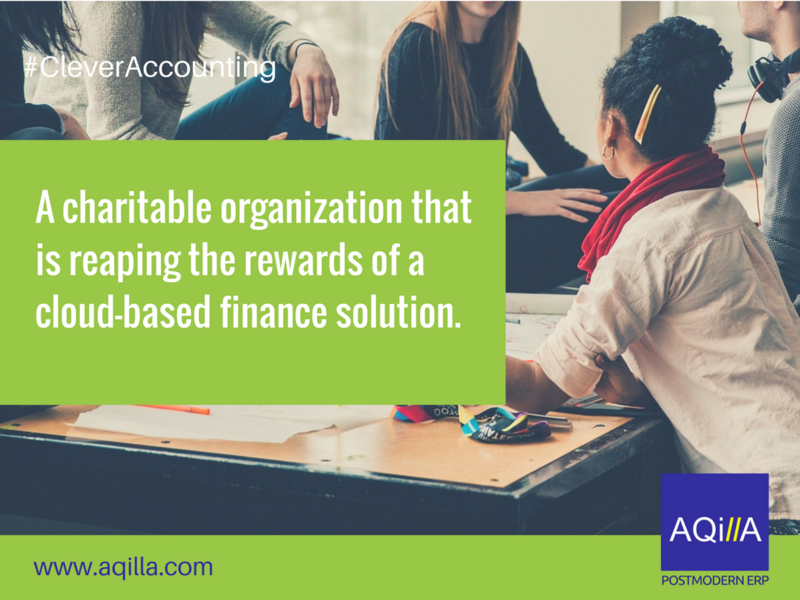 Upon adoption of a cloud-based accounting system, there was an immediate benefit in terms of financial reporting and analysis. The basics were in place from day one including full SORP reporting. The management team had access to the information they required including a full net profit and loss on demand for any given period. Transactions are automatically processed including receipts of donations, course invoices, purchase invoices, payments, and orders. The system saves a huge amount of time and staff administration — estimated to be in the range of £40k per year. Using a cloud or web-based accounting solution resolved the issue of having to have in-house file servers. Accessible from any location (all you need is a browser) the users report very fast response times. The Auditors subsequently gave Leap a glowing report on their administration. You can read the Leap case study here. The Thalidomide Trust are also benefiting from Cloud-based accounting and finance which can be tailored to meet their unique needs at a relatively low cost of entry. It was Finance Director Jenny Tunbridge’s job to oversee the implementation and ensure the system would meet the needs of not only the accounting function but also the charity’s 467 beneﬁciaries who are able to directly access personal funds administered by the Trust via a web portal. By adopting a cloud-based solution, the Trust’s payment needs are met by cleverly utilising the way in which the system handles Accounts Payable; beneﬁciary accounts have been set up as creditors and each beneﬁciary has their own record. Some have multiple bank accounts into which funds are paid but users now the option of selecting their preferred account. Detailed modiﬁcations have also been made to the system’s document reference terms and tabs in order improve the overall user experience. Beneﬁciaries are also able to access and view their accounts, in bank statement format, from a web-hosted portal. As a result, the charity has enjoyed some early returns on investment both financially and thanks to efficient reporting that saves time and improves information flow. A full case study can be read here. These are just some examples of charitable and NFP organisations who are currently working with us for a variety of reasons including new regulations (GDPR is obviously a very topical example of this), increasing expectations on the finance function as well as a desire to benefit from modern cloud storage and deployment capabilities. Within our Cloud Accounting and Business Software, we combine all the features and tools you need to be an effective and successful finance professional.